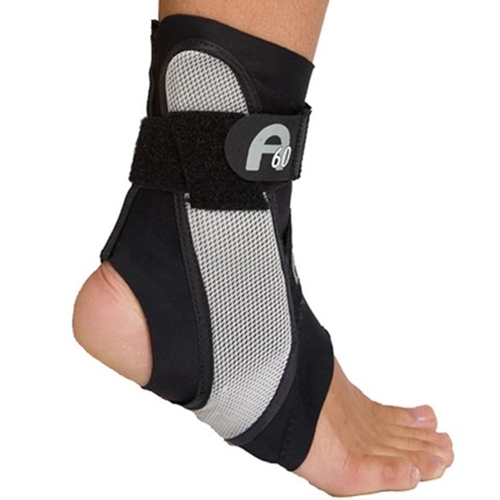 Aircast A60 Ankle Support Brace from HealthyKin.com provides a winning combination of effective support and protection, comfort, and simplified application. The patent pending design incorporates a sleek stabilizer located on either side of the ankle. This stabilizer is molded at a 60 degree angle to help guard against ankle sprains and prevent rollover. Manufactured from breathable material, the A60 ensures that the wearer stays comfortably cool and dry, while the light-weight anatomic design easily fits in athletic footwear without creating additional bulk. The A60 is applied and adjusted with a single strap that securely holds it in place; replacing time-consuming lacing.The A60 Ankle Support is available in three sizes: small, medium, and large, with left and right models. I placed the order around 4:30 on a Friday evening. It was mailed that same evening @ 5:30. I received it the following Wednesday. It worked perfectly. It is thin enough to fit into my shoe and it enabled me to get out of boot that I had been wearing for six weeks. It is wonderful. This brace is quite bad. I purchased it for right ankle because I use the ASO brand for my left ankle (works well) and I was swayed by this one because of the comment about "Used by Andy Murray". It does in no way stabilize the ankle like the ASO brace does and it is quite uncomfortable on the sole of the foot due to how it is constructed. This is a joke of a product and I'm rather flabbergasted it is still sold.